About Investment Savings Bank – It’s Simply Better! 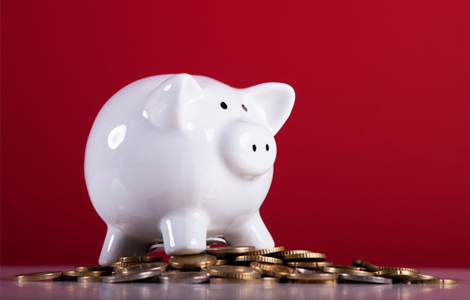 Investment Savings Bank is a community-based, PA-chartered, “well-capitalized” FDIC-insured Mutual Savings Bank and mortgage-based lending specialist, with offices in Altoona and Duncansville. 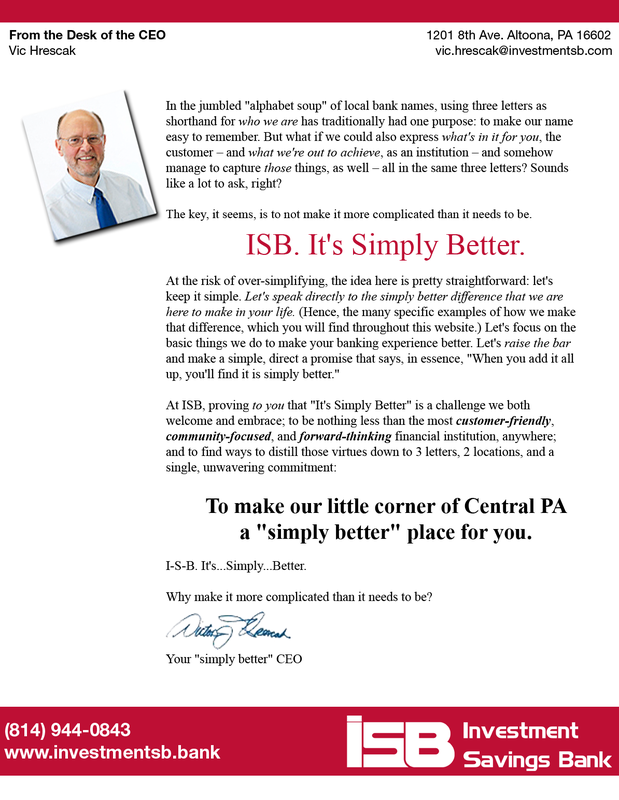 One of the soundest, strongest and safest institutions in Central PA, ISB enjoys the highest rating (“five-stars”) awarded by the independent ratings service Bauer Financial – a distinction that’s been earned for over 24 consecutive years. ISB traces its origins to Altoona’s “Little Italy” neighborhood over 70 years ago – but its roots go back even further. Chartered in 1939 (under the name Investment Building and Loan Association of Altoona Pennsylvania), and operating continuously since its inception, today’s ISB was born out of the consolidation of a number of smaller building and loans, whose names (Germania, Teutonia, Eighth Ward, etc.) often reflected the immigrant constituencies and working neighborhoods of their era. Starting in 1940, the newly consolidated operations set up shop in a small frame building at 808 Twelfth Street. A new charter soon followed, creating Investment Savings and Loan Association of Altoona, Pennsylvania as a state-chartered mutual (meaning it was owned by its depositors, as opposed to owned by shareholder investors). In 1953, operations moved into the newly constructed facility at 1201 Eighth Avenue that continues to serve as the institution’s headquarters (undergoing numerous expansions along the way). A branch office at 322 Allegheny Street in Hollidaysburg was opened two years later, continuing in that same location until July of 2013, when branch office operations were expanded and moved to 201 Patchway Road, in Duncansville.